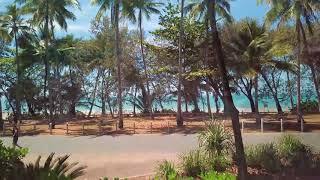 The Peninsula Boutique Hotel is perfectly positioned at the beachside end of Macrossan Street overlooking pristine Four Mile Beach and the sparkling Coral Sea, less than a two minute walk to the village centre, shopping, restaurants. Spacious modern tropical, light and contemporary designed one bedroom fully air-conditioned suites, with large private balconies, 28 have ocean views, six have pool views. Lift access to upper levels. Doors fully open enabling the outside and inside areas to become one. The discreetly concealed kitchenette offers everything you need. The ensuite bathroom features separate walk-in shower plus relax in the large two person bath with aromatherapy oils. Enjoy the heated freshwater pools and spa/jacuzzi. Port Douglas Peninsula Boutique Hotel represents an adults only unique concept in holiday accommodation - the comfort and facilities of a hotel with the friendliness and personal service that only a small property can provide. Indulge at Hi Tide Beach Cafe and Restaurant with its innovative cuisine and cocktail bar. When it's time to explore the reef and rainforest or embark on a day of adventure their tour desk staff are there to assist you plan the best experiences to suit you. Overlooking their multi tiered heated pool oasis with glimpses of rainforest covered Flagstaff Hill and Tableland ranges. These one bedroom suites capture the afternoon sun on your private terrace or balcony. An abundance of natural light enhances the colour palate reflecting their close proximity to the Daintree rainforest and Great Barrier Reef. Designed with the tropics in mind their Poolview suites enjoy the same facilities of their Oceanview Suites including discreet kitchenette with full size refrigerator, hot plates and microwave. Spacious ensuite bathroom with two person soaker bath to enjoy your Appelles bathroom amenities plus walk in shower. King or twin bedding configuration available on request. 100 metre level stroll to Macrossan Street and 50 metres to the beach. Wake up to the rising sun shimmering on the Coral Sea and the natural sweeping coastline of Four Mile Beach with a backdrop of mountain ranges and rainforest. With floor to ceiling opening glass doors onto your private spacious balcony, seamlessly allowing the "outside inside". This makes for the perfect holiday escape. Oceanview one bedroon suites boast a spacious open plan living/dining area which can be separated from the bedroom with native timber sliding doors. Each suite features a discreet kitchenette with full size refrigerator, hot plates and microwave. Through the bedroom the ensuite bathroom offers a walk in shower and two person soaker bath tub. King or twin bedding configuration available. These deluxe one bedroom suites are perfect for the romantics looking to escape and reconnect or simply spoiling that special someone. Offering all the comforts and benefits of the Oceanview Suites with the inclusion of a two person soaker spa tub. It's time... absorb the peace of Four Mile Beach and unwind on your terrace or balcony. Located on the ground and upper level all suites have views of Four Mile Beach and Coral Sea: Immerse yourself in the twin Spa bath - release the stress, relieve the tension, unwind and indulge. A spacious tropical style suite with a larger open plan living and dining area including opening louvres in all rooms. So unique... So private. Indulge in the beautifully appointed Peninsula Suite enjoying superb views from wrap around balconies including breathtaking views of Four Mile Beach and the Coral Sea and to the Daintree Ranges. This spacious one bedroom suite offers a large living/dining area, perfect for a romantic dinner served in the privacy of your Peninsula Suite. A private king size bedded bedroom and large ensuite bathroom with two person spa bath. Located on the upper level and perfect for that 'special' occasion, the largest of their suites - the Peninsula Suite is a unique peaceful and private setting with floor to ceiling opening doors. Relax on your private balconies with sun lounges and outdoor setting. Indulge in this prime position over looking palm fringed Four Mile Beach.